At FormDecor, our furniture inventory is fresh with the most up-to-date trends in event furniture rental. 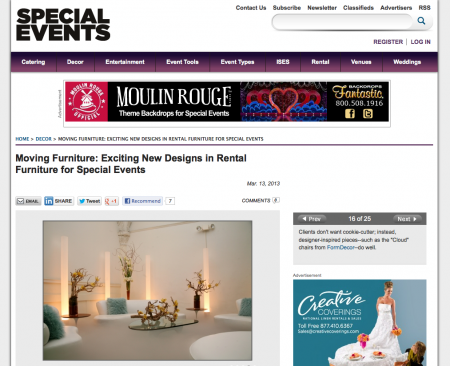 Our mention in Special Events Magazine’s most recent article on new design and furniture trends proves FormDecor has what it takes to provide you with the best selection of furniture. Whether it’s our Cloud Sofas, Corset Lounge Chair or Moulin Screen, FormDecor has the widest selection of unique furniture rentals that are sure to be a hit at any event, wedding or trade show. To see the article in Special Event’s Magazine, click here. This entry was posted in As Seen and Heard On... and tagged event decor, Event Furniture Rental, wedding furniture rentals, event furniture trends, los angeles furniture rentals, special event rentals, Special Events Magazine, unique furniture rental. Bookmark the permalink. FormDecor on the ‘Shahs of Sunset’ Reunion! FormDecor: From our Warehouse to Your TV Screen!